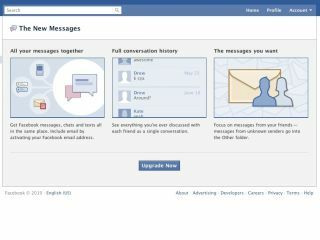 The "future of modern messaging"
Facebook says Messages will provide a "full, rich history with each of your friends"
The "future of modern messaging" - that's what Facebook is calling its new Facebook Messages service. The revamped feature brings your email, IMs, Facebook messages and texts into one seamless inbox. In theory, Facebook Messages enables various forms of communication to take place on Facebook - even texts. We're interested to see how that works in practice but, for now, Facebook has given us these images to give us a feel for the new offering. When the new Messages service is available for you, you'll see the below message. Alternatively, you might see this new Messages splash screen if you click on the Messages sidebar link. Here's the email setup screen. You'll see new messages appear much as before - all of your messages are integrated into a single, continuous thread. Messages from friends are prioritised and that everything else goes into a separate 'other' folder - rather like Gmail's new Priority Inbox. There are also other enhancements such as adding or removing people from threads, sending attachments or forwarding messages. You can also choose to receive texts into Facebook - choose your country, then your carrier. Faster communication: If you want, you can send Messages just by hitting your enter key, so using Messages is as fast (and as casual) as an in-person conversation. Smart filtering: You'll always see what's important to you first – messages from the people you're close to take precedence over mailing lists. Adding people to a thread: Loop people into conversations more easily. Forwarding: Pass a message along to other friends directly. Unsubscribe, or removing yourself from a thread: Opt to leave a group conversation when you no longer wish to be involved. Sending attachments: Aside from links, photos, and videos, you can now include external files in your messages.